This is a review and recommendation of The Laptop Repair Workbook: An Introduction to Troubleshooting and Repairing Laptop Computers by Morris Rosenthal. If you are getting started in laptop repair or you are looking for a laptop repair course, this is a fantastic lightweight book for beginners and professional alike. This book is written in simple, straightforward language aimed at all levels of readers and will keep you interested. Many people read it from cover to cover, even the sections not related to their repair, just because it’s a great read. The number of resources out there for laptop repair tends to be a little limited. Sure there are loads of books available on general computer repair, but laptop repair is a bit different. Laptops are highly engineered pieces of equipment. There is a lot of technology crammed into a very small place and a team of engineers had to work out how to compress everything into such a tiny space and still manage the excess heat that is generated from the components. One of the hardest problems to solve is exactly what is wrong with the laptop. Once you work out what is wrong you can start with your repair procedure. This books is great at helping you to work out exactly what is wrong. 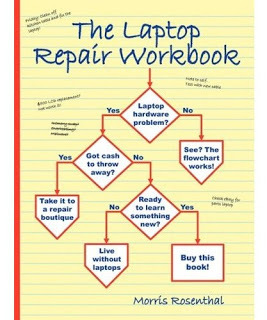 Although it may contain less in depth, complex detail than Scott Mueller’s book, The Laptop Repair Workbook has all the detail you will need. There are over 190 pages of well organised information including hardware explanations, fault-finding tips and diagnostic flowcharts to get you to the root of the problem. It is simply the best laptop diagnostic guide available and should be on every computer repair guy’s bookshelf. This book is all about getting you to the actual problem as fast as possible. It gives the laptop owner a way to ascertain what is broken with the laptop, so that you can decide whether a home repair is economical compared to taking it to your local the repair shop, or even whether it would be better to decide it is best to replace the laptop completely. After all, a lot of the problems may be due to the integrated components built into the motherboard. In which case it might not be possible to repair, unless it is a graphics problem that can be fixed with a reflow. In summary, a fantastic little book that every computer repair person should have a copy of. And at the price, it is well worth it!